It is well documented that anti slip stair nosing should be used in areas of public footfall, but offices are increasingly turning to stair nosing to help with both safety and aesthetics. 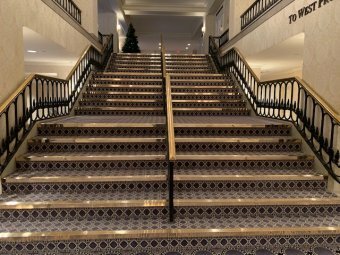 The vast majority of commercial landlords, building owners and facility managers fully appreciate the potential dangers to customers and the public of slipping or tripping on their office staircases. This, in particular, is a risk for both the elderly or very young. Here we look at the options available to office managers for office stair nosing that can help to make their stairs safer. Many think of stair nosing as the chunky, hard wearing anti slip stair nosing usually found on stair cases in schools, hospitals or government building. They are highly functional but not particularly pleasing on the eye. Office stair nosing is different. The range of styles and finishes can help add a touch of style and class to the stairs in any style of office décor. In addition to the wide range of styles of office stair nosing, there is also a selection of finishes that can be applied to help meet the style you need, be it traditional or contemporary. Why Fit Office Stair Nosing? It is worth noting that any office stair nosing will need to be compliant with the Disability Discrimination Act (DDA) but also meet the current Building Regulations. To help our customers understand this particular area, back in August we wrote an article entitled “Anti Slip Stair Nosing – Reasons to ensure they’re fitted”. This helped explain the reasoning and benefits for stair nosing, whilst also containing a link to more the more technical information. As can be seen from the article mentioned above, there are some very good reasons to ensure that offices have their stair cases fitted with stair nosing, not only fiscal but also reputational. If you would like to discuss how we can help you with our range of office stair nosing, please give us a call on 0208 866 8664.